Whether it is an European cuisine or Asian cuisine, snacking is a part of it. Especially in Indian cuisine, snacks are considered as an essential part of indian cuisine. In india, we can see a wide varieties of snacks recipes which is different in taste and texture from place to place. Evening tea without a snack is unimaginable for many of us these days. So we always prefer to make some healthy snacks recipes at home. And moreover as ramadan is around the corner, i thought of sharing some tasty but simple snacks to make for iftar. 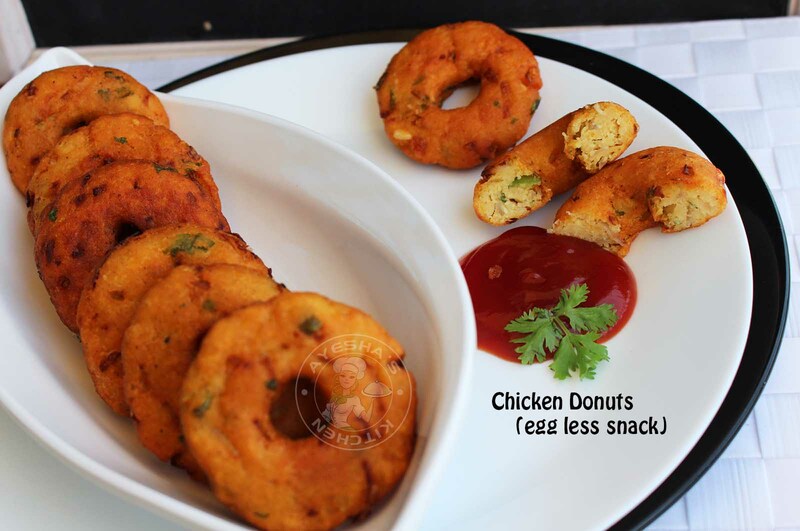 This chicken snack / chicken donuts recipe will be perfect to serve for iftar. 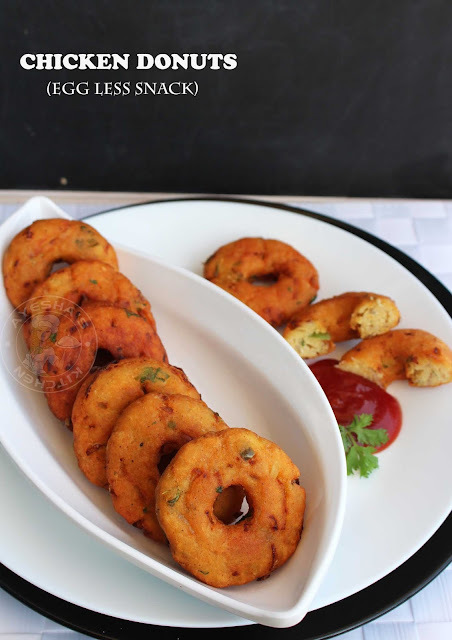 Chicken donut recipe is very easy to make and is inviting too with its lovely aroma and texture. This popular indian snack is prepared with mashed potato, minced chicken and gram flour as the main ingredients. Moreover this is an egg less snack recipe too. A spicy, soft and crispy snack to enjoy weekend evening as well. You just need to mix all those ingredients together and shape it like a doughnut / donut and then deep fry. 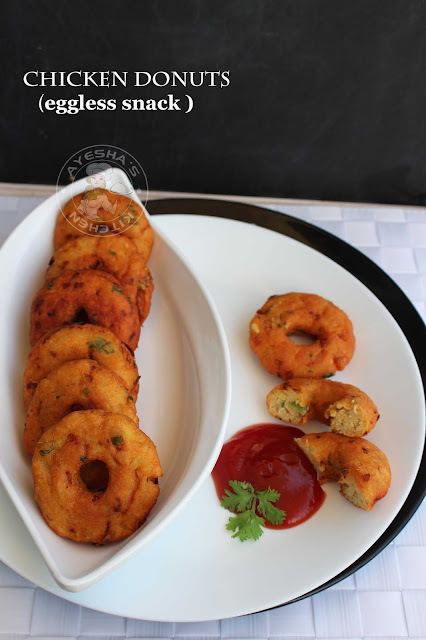 Hope you all will enjoy this easy snack to make at home or chicken donut recipe for sure. So here is the recipe showing how to make chicken donut /kids snacks /kids snack ideas / easy snack ideas / evening snacks /easy to make snacks /quick snacks / quick and easy snacks / indian snacks for kids / chicken vada /eggless recipes / ramadan recipes for iftar. Cook chicken breast with chili powder and salt with less water until tender. Pulse it in a grinder and mince it. Set aside. Pressure cook a big potato (unpeeled, quartered) with water and salt for 2 whistles. Release the air and drain the water. Peel it and mash it without any lumps. Set aside. Now take a big vessel and add chopped onion, garlic, coriander leaves, green chilies, minced chicken, mashed potato, pepper powder. Combine very well. To this add gram flour, baking powder, chili powder and salt. Mix well to form a dough consistency. Sprinkle water only if required. I do not used water. Now take a lemon sized ball out of the dough. Then flatten, make a big hole in the middle, shape it well like a donut or medu vada. Heat oil in a non stick pan for deep frying. Fry in batches over a medium flame until both sides turn golden. Serve it hot along with green chutney or ketchup.